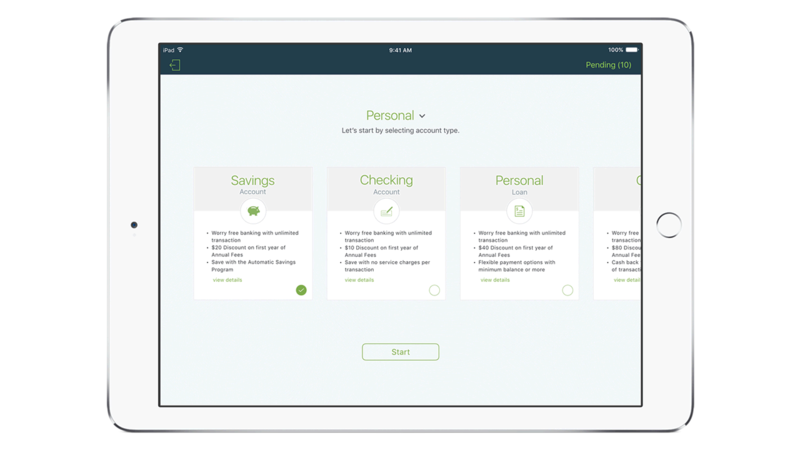 IBM MobileFirst for iOS Open Account enables your bank employees to open new accounts fast. Open Account improves the overall customer banking experience by reducing the time your customers must wait in line to open a new account. After initial set up, Open Account uses powerful analytics to deliver highly tailored account recommendations for your customers based upon their search history of your website. Using an intuitive dashboard that can both provide and capture key customer information, Open Account empowers your employees to be more efficient in the bank or on the go. Reduce customer abandonment by eliminating long lines at the bank. Save your customers time by providing streamlined and consistent services while meeting fraud and regulatory checks. Provide tailored and individualized products and services based on real time analytics. Break out of the limiting confines of your physical branch location and enable your customers to open accounts anywhere.